The Art Contest is a regular feature of the ADGA Annual Convention and is sponsored by the Annual Convention host organization. This year’s “Get Your Goat” Art Contest is being hosted by the Treasure Valley Dairy Goat Association. 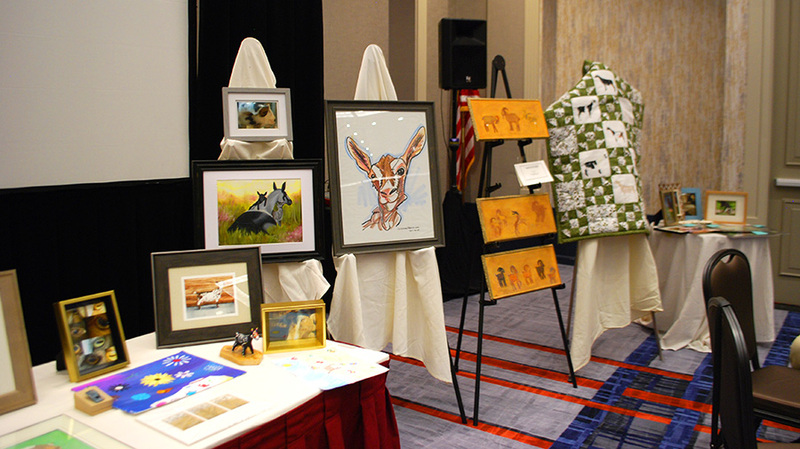 As an attendee of the convention, this is your opportunity to “Get Your Goat” through bidding for one of these unique, spectacular and creative dairy goat art pieces. All art contest entries are sold at the “Flashlight Sale,” a live auction held during the Products Reception. This year’s Flashlight Sale will be held on Thursday, October 17, 2019 during the ADGA Annual Convention Products Reception. All Awards and prizes will be administered by ADGA and presented to the winners following convention.. Youth and adults may participate. We hope you’ll consider submitting one or more entries this year! Youth Category, ages 5 – 18 as of October 1, 2019. Dairy goat themed, any size, any medium. Paint, Sketch, Drawing, Embroidery, Quilting (on any type canvas, fabric, any media.) Minimum size is 5 x 7 inches. Maximum size is 48 x 48 inches. Sculpture (hard or soft), Figurine, Mosaic, or Needle Felted, or object painted, carved or wood burned with a dairy goat theme. No size restrictions. Jewelry – an item with a dairy goat theme. Photography – no size restrictions. Note: Defining art and media is not black and white. Many media can be utilized for art. If the article is deemed a quality acceptable art media, the entry will be gladly accepted and the contest committee will help determine the appropriate category for it. Entries must be received at the ADGA registration desk at the Riverside Hotel in Boise no later than 5:00 pm, October 15, 2019 unless prior approval is given. All entries become the property of the Treasure Valley Dairy Goat Association host committee upon submission. An independent judge or judges will make the placings. Winners in each category will receive $100 for First place, $50 for Second place and $25 for Third place. A Best of Show ($500) and Reserve ($250) will be chosen from the winners of the five categories. A People’s Choice Award will be awarded a Rosette in recognition. As many entries per category will be accepted from any individual; however, only one monetary award per person in any one category will be awarded (Best In Show being a different category). In cases where less than four entries are received, it will be up to the judges’ discretion to be considered for monetary award. The judge and show committee will determine If an entry is not deemed suitable for competition. Please include a completed copy of this entry form with each contest entry.